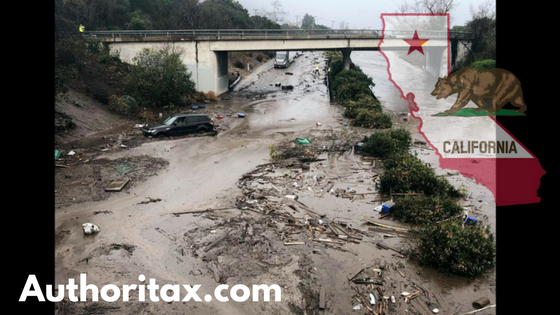 California — Victims of the wildfires, flooding, mudflows and debris flows that took place beginning on Dec. 4, 2017, in parts of California may qualify for tax relief from the Internal Revenue Service. Your tax dates have changed: The declaration permits the IRS to postpone certain deadlines for taxpayers who reside or have a business in the disaster area. For instance, certain deadlines falling on or after Dec. 4, 2017, and before April 30, 2018, are granted additional time to file through April 30, 2018. This includes 2017 individual income tax returns normally due on April 17, 2018. It also includes the fourth quarter estimated tax payment normally due on Jan. 16, 2018. In addition, penalties on payroll and excise tax deposits due on or after the tax dates Dec. 4, 2017, and before Dec. 19, 2017, will be abated as long as the deposits were made before Dec. 19, 2017. The IRS automatically identifies taxpayers located in the covered disaster area and applies for automatic filing and payment relief. But affected taxpayers who reside or have a business located outside the covered disaster area must call the IRS disaster hotline at 866-562-5227 to request this tax relief. those taxpayers listed in Treas. Reg. § 301.7508A-1(d)(1), and include individuals who live, and businesses (including tax-exempt organizations) whose principal place of business is located, in the covered disaster area. Taxpayers not in the covered disaster area, but whose records necessary to meet a deadline listed in Treas. Reg. § 301.7508A-1(c) are in the covered disaster area, are also entitled to relief. In addition, all relief workers affiliated with a recognized government or philanthropic organization assisting in the relief activities in the covered disaster area and any individual visiting the covered disaster area who was killed or injured as a result of the disaster are entitled to relief. Under section 7508A, the IRS gives affected taxpayers until April 30, 2018, to file most tax returns (including individual, corporate, and estate and trust income tax returns; partnership returns, S corporation returns, and trust returns; estate, gift, and generation-skipping transfer tax returns; and employment and certain excise tax returns; annual information returns of tax-exempt organizations; and employment and certain excise tax returns), that have either an original or extended tax dates due occurring on or after Dec. 4, 2017, and before April 30, 2018. Affected taxpayers that have an estimated income tax payment originally due on or after December 4, 2017, and before April 30, 2018, will not be subject to penalties for failure to pay estimated tax installments as long as such payments are paid on or before April 30, 2018. The IRS also gives affected taxpayers until April 30, 2018, to perform other time-sensitive actions described in Treas. Reg. § 301.7508A-1(c)(1) and Rev. Proc. 2007-56, 2007-34 I.R.B. 388 (Aug. 20, 2007), that are due to be performed on or after Dec. 4, 2017, and before April 30, 2018.
or to employment and excise tax deposits. Specific tax dates for tax deposits: penalties on deposits due on or after Dec. 4, 2017, and before Dec. 19, 2017, will be abated as long as the tax deposits were made by Dec. 19, 2017. Affected taxpayers in a federally declared disaster area have the option of claiming disaster-related casualty losses on their federal income tax return for either the year in which the event occurred or the prior year. See Publication 547 for details. Affected taxpayers who are contacted by the IRS on a collection or examination matter should explain how the disaster impacts them so that the IRS can provide appropriate consideration to their case. Taxpayers may download forms and publications from the official IRS website, irs.gov, or order them by calling 800-829-3676. The IRS toll-free number for general tax questions is 800-829-1040." Need Help Filing Your Taxes This Year?